mammograms | Live Healthy S.C. According to the American Cancer Society, breast cancer is the most common cancer among women. In 2015, there will be an estimated 3,820 new cases of breast cancer in South Carolina, and an estimated 620 deaths from the disease. But if detected early through screening and early diagnosis, breast cancer can be treated successfully. Being informed about screening options and making healthy lifestyle choices can help you take care of your body. Steady declines in breast cancer mortality among women since 1989 have been attributed to a combination of early detection and improvements in treatment. For most women, breast cancer screenings include self exams, annual clinical breast exams and mammography. 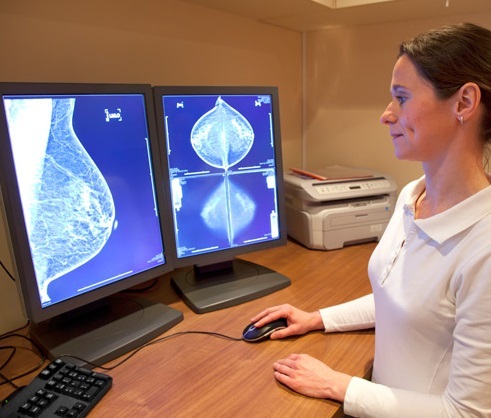 Mammography can often detect breast cancer at an early stage before any symptoms are present, and this early detection is when treatment is more effective. For younger women or women with dense breasts, digital mammography or ultrasound imaging in combination with standard mammography may increase the likelihood of detecting cancer. For most women at high risk of breast cancer, annual screening using magnetic resonance imaging (MRI) in addition to mammography is recommended, typically starting at the age of 30. To know what screenings are right for you, please talk to your healthcare provider and visit the American Cancer Society (ACS) and the United States Preventive Services Task Force (USPSTF) websites for leading guidelines. Get familiar with the known benefits, limitations, and potential harms linked to breast cancer screening and know how your breasts normally look and feel and report any changes to a health care provider right away. Knowing that all women should have access to preventive care, DHEC’s Best Chance Network (BCN) offers free breast and cervical cancer screenings to women who meet certain risk and income eligibility requirements. DHEC partners with the South-Atlantic Division of the American Cancer Society and more than 400 health care providers in every county of the state to coordinate cancer screenings for these underserved women. Who May Qualify for Free Cancer Screenings? Now in its 25th year, BCN has provided more than 155,000 eligible women with breast and cervical cancer screening and has helped diagnose more than 1,600 breast cancers and 2,500 pre-cervical and cervical cancers since 1991.The program is funded through a cooperative agreement with the Centers for Disease Control and Prevention. Eat a variety of vegetables, fruits and whole grains regularly. Stay active or increase your daily physical activity. Avoid or reduce alcohol consumption. By providing access to early detection and treatment services, more women in South Carolina can win their battle against cancer. For more information, call the American Cancer Society at 1-800-227-2345, and ask about the South Carolina BCN. This entry was posted in Community Health, Prevention and tagged breast cancer, cancer, mammograms, Women's health on October 29, 2015 by SC DHEC.